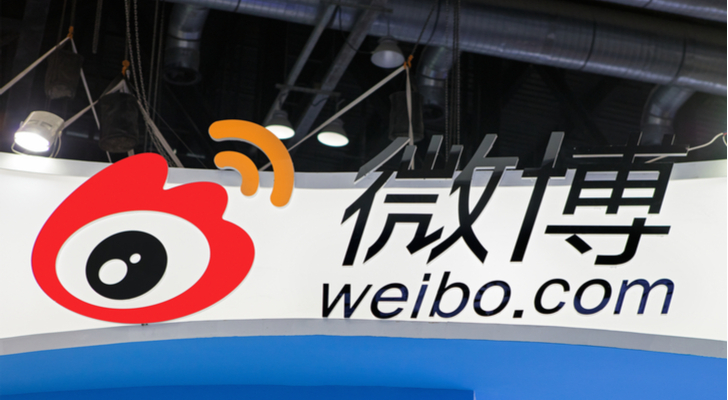 It sounds crazy to call a stock with a trailing price-to-sales ratio of 23 cheap, but that very well may be the case with Weibo Corp (ADR) (NASDAQ:WB). But what if I told you that shares of ABC was actually Visa Inc (NYSE:V), which trades at 23 times forward earnings and is expected to grow earnings 27% this year and 17.5% in 2019? Or that XYZ is actually Facebook Inc (NASDAQ:FB). Despite its testifying CEO and ongoing user-data issues, shares trades at just 18.8 times forward earnings, while estimates call for 34% and 21.5% earnings growth in 2018 and 2019, respectively. Then it’s a different ballgame, right? Margins can be a big difference maker. That and strong sales growth can make these trailing-sales metrics look quite expensive vs. reality. With that in mind, let’s take a closer look at WB stock price. Weibo stock trades at 23 times last year’s revenue, but analysts expect sales to surge almost 57% this year. Weibo’s not a one-hit wonder either, with estimates calling for 37% growth in 2019 as well. That’s rather impressive — and usually only a growth rate we see with small and/or unprofitable companies. While Weibo isn’t Alibaba Group Holding Ltd (NYSE:BABA), its $27 billion market cap is no penny stock. It’s also not profit-less. Analysts expect earnings per share of $2.81 this year, up 56% year-over-year. In 2019, consensus estimates call for further growth of almost 44%. In this light, WB stock price trades at 41 times 2018 estimates and just 29 times forward earnings estimates. While 29 times 2019 estimates isn’t exactly cheap in many investors’ minds, it’s not that bad when you consider that it will grow earnings and sales by 50% this year and both by almost 40% the following year. Buying WB stock requires investors to believe that it can maintain a lofty growth rate going forward (even though the law of large numbers dictates that its growth rate will inevitably slow over time). Let’s stick with Visa and FB as quick comparisons. These are high margin, high sales valuation, profitable outfits like Weibo. Does WB stock deserve the premium? Its gross margins of 80% are very impressive, but trail Visa’s 82% and Facebook’s 86%. Weibo’s profit margins of 30.6% also trail Visa and Facebook’s profit margin of 38.1% and 39.2%, respectively. If Weibo can maintain those margins though, or at least stay close them, the share price can grow into the heady valuation it has now and become more relatable over time. For now though, business is strong and growth should remain solid. So where did we get the 30% upside from? The highest price target on Wall Street currently stands at $160, implying almost 31% upside from current levels — and that’s not just some rogue bull either. The average price target sits just below, near $153 and implies close to 25% upside. Clearly, Wall Street is optimistic on the stock. Let’s look at the chart. The 50-day is above the 100-day moving average and both moving averages are above the 200-day. In other words, the trend has been quite bullish despite WB stock showing some signs of deterioration over the past month or so. After topping out at $140 several times in February and March, Weibo stock put in a lower high, before falling below the 50- and 100-day moving average. Worse, it broke below trend-line support (in black). Fortunately $110 held up as support (blue line). So where to now? 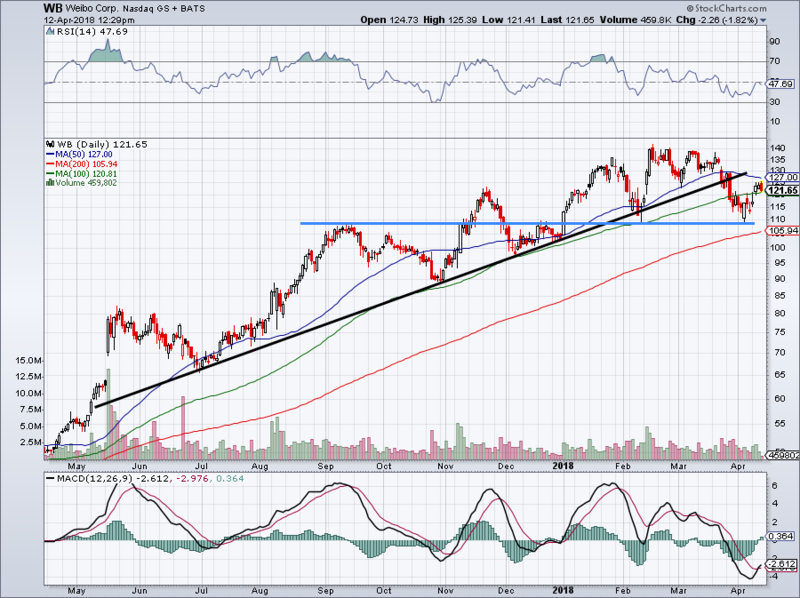 It would take a rally over $130, but WB stock above trend-line support would be quite bullish. If not, it doesn’t instantly turn the WB stock chart bearish, though. So long as shares stay above $110, it could bullishly digest the big rally its had over the past year. Remember, the stock was trading at $60 less than one year ago. Now at $122, WB has more than doubled. What do we do now? For those on the sidelines, WB stock is sort of in no man’s land. I would look to buy on a pullback to $110, on a breakout over $140 or possibly on a move back above trend-line support. Bret Kenwell is the manager and author of Future Blue Chips and is on Twitter @BretKenwell. As of this writing, Bret Kenwell held a position in V.
Article printed from InvestorPlace Media, https://investorplace.com/2018/04/trading-weibo-wb-stock-price/.